Ben Daniel Crenshaw (born January 11, 1952) is a retired American professional golfer who has won 19 events on the PGA Tour, including two major championships: the Masters Tournament in 1984 and 1995. He is nicknamed Gentle Ben. Born in Austin, Texas, Crenshaw attended and played golf at Austin High School and the University of Texas, where he won three NCAA Championships from 1971 to 1973. He was also a member of the Kappa Alpha Order fraternity. He turned professional in 1973. In 1973, Crenshaw became the second player in Tour history to win the first event of his career; this accomplishment was achieved earlier by Marty Fleckman (1967) and later repeated by Jim Benepe (1988), Robert Gamez (1990), Garrett Willis (2001), and Russell Henley (2013). Following five runner-up finishes in major championships without a victory, including losing a sudden-death playoff for the 1979 PGA Championship, in 1984 he won The Masters. In the mid-1980s, he suffered from Graves' disease, a disease of the thyroid, but he continued to accumulate victories, finishing with 19 on the PGA Tour, including an emotional second Masters victory in 1995, which came a week after the death of his mentor Harvey Penick. In 1999, he was selected as captain of the United States Ryder Cup team for the matches at The Country Club, Brookline, Massachusetts. He was criticized from some quarters for his captaincy over the first two days as his team slipped to a 10-6 deficit; however, he was ultimately credited for providing the inspiration behind his side's remarkable turnaround in the Sunday singles, as the U.S. won 8 ½ of the final day's 12 points to regain the Cup. Crenshaw won several professional events outside the PGA Tour, including individual and team titles in the World Cup of Golf in 1988. He was among the top ten on McCormack's World Golf Rankings from 1976 to 1981 inclusive, and returned to spend 80 weeks in the top-10 of the Official World Golf Ranking from 1987 to 1989. In 1987, he became one of the few players in history to finish in the top ten of all four major championships in the same season without winning any of them. Crenshaw is widely regarded as one of the best putters in golf history. His instructor growing up, Harvey Penick, taught him a smooth, effortless stroke on the greens, which allowed him to master even the speediest of greens–including those at Augusta National Golf Club. In winning the Masters in 1995, "Gentle Ben" did not record a single three-putt during the tournament. Since 1986, Crenshaw has been a partner with Bill Coore in Coore & Crenshaw, a golf course design firm. The 2015 Masters was the 44th and final for Crenshaw. Crenshaw married his second wife Julie in 1985. All three of his daughters were presented to high society as debutantes at the International Debutante Ball at the Waldorf-Astoria Hotel in New York City. Politically, Crenshaw is a Republican, and has donated money to multiple Republican candidates. He played on four Ryder Cup teams (1981, 1983, 1987, 1995) and captained the 1999 team. In 1987, he became one of the few players in history to record top-10 finishes in all four major championships in the same season. Ed Dudley, Arnold Palmer, Gary Player, Doug Sanders, Miller Barber, Jack Nicklaus, Hale Irwin, Tom Watson, Tiger Woods, Sergio García, Ernie Els, Phil Mickelson, Rickie Fowler, Jordan Spieth, and Vijay Singh have also achieved the feat. In 1991, Crenshaw was given the Bob Jones Award, the highest honor bestowed by the United States Golf Association in recognition of distinguished sportsmanship in golf. His stepmother, Roberta Crenshaw, was an Austin-area philanthropist. He is now a noted golf course designer, working in partnership with Bill Coore. He was inducted into the World Golf Hall of Fame in 2002. He is the 2006 Kappa Alpha Order Sportsman of the Year. "If we are to preserve the integrity of golf as left to us by our forefathers, it is up to all of us to carry on the true spirit of the game." ^ Jenkins, Dan (February 11, 1974). "Gentle Ben Is Very Tough". Sports Illustrated. ^ "69 Players Who Have Reached The Top-10 In World Ranking" (PDF). Official World Golf Ranking. Retrieved December 23, 2013. ^ "Old master Ben Crenshaw soaks up the last ovation as folklore reigns". The Guardian. April 11, 2015. Retrieved April 13, 2015. ^ "Biography: Ben Crenshaw". bencrenshaw.com. Retrieved August 15, 2018. ^ Valentine, Uhovski (December 31, 2010). "At Waldorf, a Ball With Belles and Whistles". The Wall Street Journal. Retrieved May 9, 2018. ^ Search results for ben crenshaw. OpenSecrets. Retrieved on 2018-06-11. ^ "1997 Nitro Texas State Open". Archived from the original on February 6, 2012. Retrieved December 23, 2013. 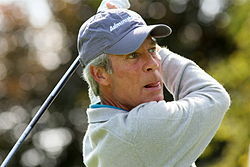 Wikimedia Commons has media related to Ben Crenshaw. This page was last edited on 18 December 2018, at 05:59 (UTC).